1986 World Cup: One-Man-Team or Forgotten Heroes? Written kindly for TFHB - James Ferrier takes a closer look at the 1986 World Cup and the success of Argentina's often forgotten achievers. The 1986 World Cup in Mexico, for any Briton, is remembered for two things; the hand of God and ‘that run’ by Diego Maradona. It is probably highlighted most by anyone in England for the fact it knocked the country out of the tournament, but looking into the Argentina team it is rare to name a single player from that squad I can recall apart from a certain Maradona. Did he win Argentina the World Cup single-handed or has, because of what he did, his brilliance been put on a pedestal? So let's look closer at the Argentinian squad from 1986. Seven players played outside of South America for their respective clubs with the fifteen others remaining inside the South American nation. In 1986 it was very unlikely that the British football fans had heard of, or knew much about those Argentinian players that were not plying their trade in Europe. They did not have today's technology that allowed them to instantly access information about players from all over the world. Therefore, the Argentinian team going into the tournament was largely unknown to the British population and this was a major factor as to why Maradona was singled out from the rest of the team. Coming into the World Cup Maradona was known as one of the players to watch. After an impressive season with Napoli (scoring 13 goals in 31 games) he was seen as Argentina's only hope for them to progress. Scoring five goals in the tournament and captaining the side saw him single handily take the team to the final and beat the incredible West Germany side 3-2, or so it would seem. In truth, yes he did put in brilliant performances in the tournament, most notably against England and Belgium, scoring four goals in the two games but he never scored in the final and scored only one goal in the group stages (in the draw against Italy) so if he wasn’t the man scoring and doing everything, then who was? Real Madrid striker Jorge Valdano is a name you might not remember in 2015 and, unless you were a massive fan of his, would probably know little about him. Scoring three goals in the group stages and once in the final would normally have left a legacy about him, but in his case he is barely mentioned. A quick search about him brings up only results of being a former Real Madrid director and his dislike of the English game. For a man who offered so much to the World Cup you would expect more of an impact. Carlos Bilardo was the manager at the time of the World Cup, which, again, is a name that would not necessarily ring a bell amongst football fans today. He took on the Argentina job after successful spells at the Columbian national team and Argentinian side Estudiantes de La Plata. 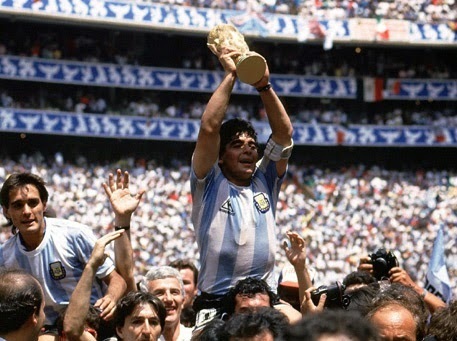 In the match reports regarding the manager he was dubbed ‘Master of the Success.’ He was the man who gave Maradona the captain's armband which at the time was not greeted positively as people felt Maradona did not represent the wider squad, having him as the captain forced El Diez to change his mentality from a soloist to a team player. Carlos Bilardo could be described as the manager least credited with the success of his team in recent times. In every great team there is a great manager and how little he is actually mentioned within football is a travesty within itself. For every fantastic player within the World Cup there are players around him you can describe as being great too. For Brazil in Pele there was also a Rivelino and a Garrincha. For England in Geoff Hurst there was also a Bobby Charlton and a Gordon Banks, the list goes on and on. With Argentina in the 1986 World Cup where they have Diego Maradona it is seen as if there was only him and the players around him were mere spectators of his brilliance, which evidently undermines their contribution to the cause. Diego Maradona was a brilliant player and one which will live on forever as one of the greatest and there is no denying that, but if it was not for the brilliance of Carlos Bilardo in building the team around Maradona and the players around him, such as Valdano, who were able to live in the shadows and let him perform, then their would not have been a 1986 World Cup victory for Argentina. With every great player there is a great team and the fact that outside of South America people will never know how great the side truly was is something which needs to change. Women's Football: A Victorian Disgrace?